Here's what I have to get rid of, and also some Superstuff that I want. I will trade some of these things for the items I want, or cash is fine too! E-mail me for more info on any item. $20 including shipping, insurance extra(continental U.S. only). 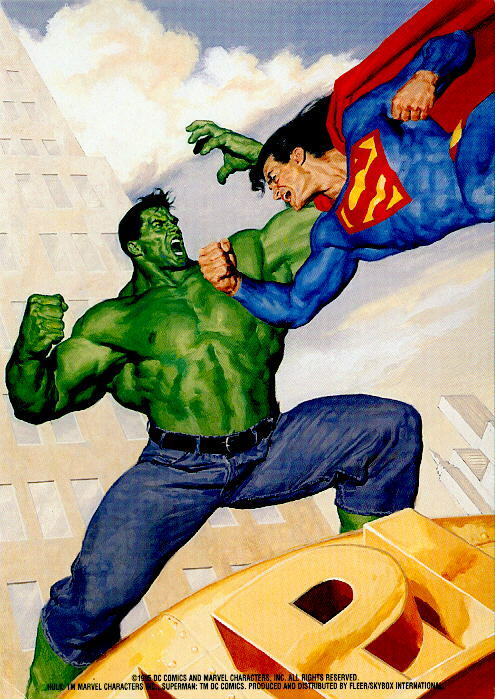 Will also include a 5 x 7 painted card of Superman & The Hulk that came in boxes of this series, a $10 value. The card does have a light quarter-sized mark on the back, but the front is fine, and you are getting it for a reduced price. Click here to see it. These are 4 3/4 inch long cards, so you will need the longer card pages. Including 13 chase cards listed below. $25 with the chase cards, $18 without chase cards including shipping (continental U.S. only). Will sell the chase cards separately, so just ask for prices. 1. Superman (painted version of the classic Action Comics #1 pose) the back of this card is off center by 1/3 of a cm due to a printing defect, but the front is normal. 1, 4, 5, 6, 7, 8, 12, 13, 15, 17, 18, 19, 20 $.50 each, or $5.00 for all. L&C 6: Picture has a black & white picture of Lois & Clark wearing tank tops, and Clark has a color Superman tattoo. The background is metallic foil. The back is part of a puzzle. $2. Also have many single cards from various DC card sets. Ask for a specific card, and I'll see if I have it. Both of these glasses are in fantastic shape. They are in the best condition I have seen of any collectible glasses. One is approx. 4 1/8 inches tall and has a diameter of approx. 3 1/4 inches. It has Superman flying across the glass with Metropolis below him to the right. Superman's name is above the lower half of his body(It's the older style, with the letters being more square). Below his legs it says " TM & (C) DC COMICS INC. 1971 ." I would describe this glass as near mint, and the colors are bright. $20 plus shipping. The other glass is approx. 6 1/3 inches tall and has a diameter of approx. 3 inches. It tapers down so the bottom of the glass has a diameter of 2 1/4 inches. It has Superman on both sides of it with his arms slightly away from his sides and his cape flowing. He has a yellow circle behind him and his name is below him in red and blue. The picture may be drawn by Curt Swan. In between the two pictures on the side it has the Pepsi sign and the word Super, and when read together it says Pepsi Super Series. Below that it says " (C) DC COMICS INC. 1976 ." This one I would also say is near mint and also has bright colors. $18 plus shipping.